an organization or authority that centralizes and standardizes the management of Projects. 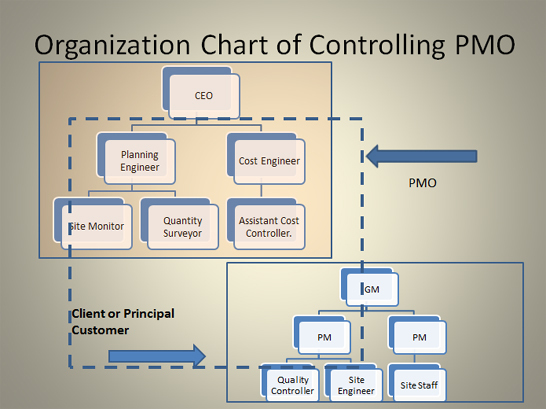 PMO can be departmental unit with in the organization or it can be an outsourced agency. Generally provides the policies, methodology ,templates, lessons learned for managing projects within the organization. This type of PMO provides support and guidance to the organization on how to manage the projects. Provides professional project managers and project management team for different projects. To provide a baseline Time Schedule for every project so that it serves as a reference point for monitoring project variances and deviations. To provide Internal Budgets (Cost Baseline) using state of the art costing program. To assist the tendering department in achieving success to fetch business in these competitive environments. To provide quantity surveying services for reconciliation of actual work quantities with the contract quantities. To administer and recommend change orders by professional interpretation of the Project Contract. To assist Project Managers in the implementation of PMBOK guidelines of Project Management to achieve successful completion of project with due satisfaction of all stakeholders. To perform effective Work Force Levelling based on calculated manpower productivity norms.